Gopal sat on the banks of the river and watched as his herd fossicked among grassland and then carefully made their way down the slippery path to a shallow portion of the waterway to drink. He lived in the village of Deviganj and among his brothers it was his responsibility to care for the herd. The rest worked their ancestral land and had to be constantly vigilant to protect it against attempted creeping takeover of portions of the property both day and night. His father told of portion of that property being forcibly taken over by migrants after partition of the country previously administered by the former British Raj. Gopal shrugged as he thought of the story, everyone would try to survive in whatever way they could, but they’d have to account for their actions at the time of death and reincarnation he believed. He wondered if those who’d stolen his family property would come back as worms or some other form of lower life and must work their way again through eons of time to be part of humankind. Gopal thought of the previous week when there was a dispute with children of migrants now elevated through appointments by authorities in Dhaka the capital to be administrators of the village. They’d taken nets to Gopal’s family fish pond on their property to harvest fish. Two of Gopal’s brothers had been badly beaten when they tried to prevent this theft. These village officials had declared the pond on their property a common village area and this had been now raised by his family with officials in Dhaka asking to prevent such acts in future. The villagers could easily fish in the river where fish were plentiful, but they had a purpose in fishing here. Events seemed to be working against the Hindu’s of the village since their new status as a minority. First the shrines to Hindu gods in the village had been destroyed as idols thundered against in the Quran. There had been occasional defacing of village temples, but Hindus had fought back with such determination that no attempt had been made since to destroy temples. It had been ruled in Dhaka that minorities should be protected but often actions of the Central Government made no impression at all on local villages where village majority viewpoints were the real rules and law. Gopal’s family rice paddy fields flooded during the monsoon, but the family homestead was elevated on land overlooking fields and is sight of the Mission Hospital where his sisters sometimes worked helping with cleaning and cooking. Foreign doctors came and went to service village needs through the hospital. Sometimes with available local trained para-medical workers it functioned as a clinic until another foreign doctor could be found to care for surgeries. As this was the only hospital to offer surgeries in the village those with complicated medical issues had to take the long and tortuous journey to Dhaka for treatment when on foreign doctor came and some died on the way. It was becoming very difficult to get permission for foreigners to enter the country to work so foreign doctors who’d lived and worked at the hospital in the past sponsored locals for medical training. As Christians and Hindu’s were in the minority it was very difficult for them to find a place in local medical training institutions even if sponsored, so often that hospital functioned as best it could with those trained by the foreign doctors. 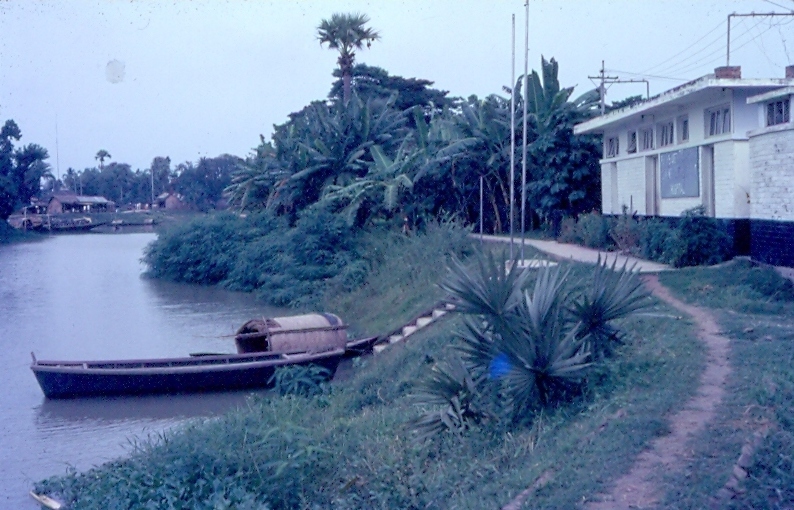 Deviganj stood on the bank of one of the mighty Ganges River delta streams. From ancient times and through the rule of the Sultanate and Mughal periods Hindu Rajas maintained a continued rule. But all that changed with the partition of India. Atrocities committed on both sides of the new border caused a massive shift in population both ways. Persecuted Hindus fled to the newly created Hindu homeland and similarly persecuted followers of Islam fled to their new homeland in East Pakistan. These religious communities had lived together in relative harmony for centuries, but trauma of that forced migration changed attitudes. Pockets of each faith choosing to remain in their ancestral lands found themselves targets of discrimination and often violence on the wrong side of the border by way of retribution of lives lost and indignities suffered by persecuting mobs. But attachment to the land of their ancestors built a resolve to adapt to these circumstances and hold on hoping for a return to more friendly relationships. That evening as Gopal made his way back home with the herd he stopped to listen as he approached within hearing of his home. There were sounds of wailing accompanied by angry voices. Rounding the corner, he gasped in surprise! There was a mob surrounding his home. The cows followed their usual routine continuing to the house where they’d be customarily placed in protection of a sheltered area next to the house. Gopal paused in alarm and strained to see what was happening. His sisters had been dragged out of the home by their hair and forced to watch what was going on. They were beating their chests in fear and distress. Gopal ran closer to see what the tumult was about. As he got close, he could see all brothers and his father being beaten with fists, sticks and stones. They were pleading for their lives but as Gopal watched mesmerized, he saw them fall one by one and knew they wouldn’t survive that attack. He saw one of his sisters turn as she heard the cow bells announcing the herd’s arrival and shouted to her other sisters who then turned and ran toward him crying pitifully. They stood beside him shaking seemingly incapable of taking their eyes off the violent scene. The leaders of the mob bent to examine the now silent bodies and determining they were dead shouted in victory. Turning they saw the herd approach and shouted again in victory. Having annexed the property they would take the herd for village use, perhaps one could be sacrificed that evening for an evening victory meal. Gopal was too traumatized to show emotion. He turned to his sisters and asked if any had survived. They shook their heads. Parents and other siblings were no more! Seeing the leaders turn their attention to them they ran for the river and hid among reeds. There were half hearted attempts to find them in the gathering dusk then a return to the village to celebrate. When it was dark enough for them to emerge, they headed stealthily for the Mission Hospital. The Christians of the village had all assembled there with a few surviving Hindus. No one had any idea at that time what prompted an attempt to drive all Hindu’s from the village with resulting slaughter for Gopal’s family, but they were not the only ones to be killed that day. Later it was learned village elders had been reprimanded for allowing incursions into Hindu property. The leaders smarting from the reprimand spread false rumors a Mosque had been desecrated by Hindus and mob rule took over killing innocents and appropriating property. The few who escaped had either taken shelter in the Mission Hospital or fled to Dhaka to plead their case with political leaders there. Administrators in charge of the hospital discussed the situation with those who’d fled there for protection. It was obvious to all they’d not be able to prevent a take over of the hospital should a mob come looking for survivors next day. So, taking precious money from their meagre supply they distributed a little to each person, gave them food enough for a day’s journey and urged them to depart for other places before day break. Timing departures so all would not leave at the same time inviting the interest of those awake in the village at night, most were gone by daylight. Amazing description! Amazes me how well you have related it to the settings of this nation. You’ve opened an eventful chapter, Ian. The lead up to Partition and the atrocities that followed was a horrific and tragic smear on Indian history, and politicians and so-called leaders on all three sides – Indian, Pakistani and British. And as your story shows, the atrocities continued for years thereafter. Thanks for stopping by to read my latest story Eric. I watched the tensions erupt frequently in Pune and Mumbai where I lived for twenty years and was physically present in Bangladesh just after their own war with West Pakistan when bodies were still floating in the river by Dhaka and there was blood on the floor of a shed at the school where one of the foreigners I knew was slaughtered. Human beings can have violent capabilities when they lose reason.